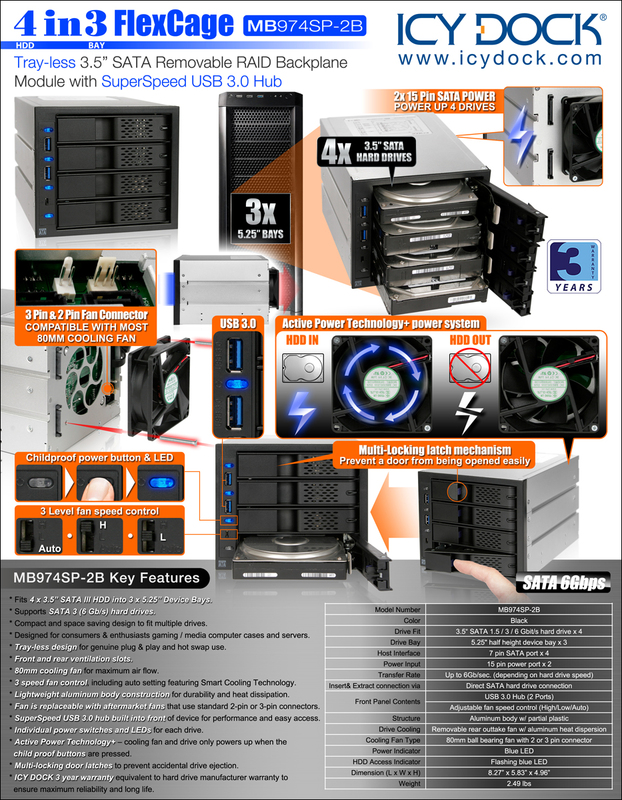 Introducing the FlexCage MB974SP-2B, a 4-in-3 Tray-less SATA 6Gbps HDD Cage for 3.5” SATA hard drives. The FlexCage brings enthusiast preferred features such as: plug & play Tray-less design, replaceable 80mm cooling fan, 3 speed fan control with Smart Cooling Technology, integrated USB 3.0 hub, and full control of your drive with individual childproof power buttons. 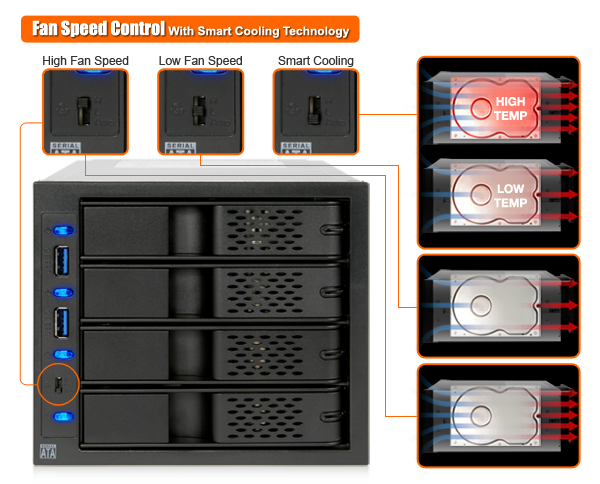 It is designed to be used in consumer and enthusiast systems such as, gaming / media computer cases, and home servers that hot swap frequently. 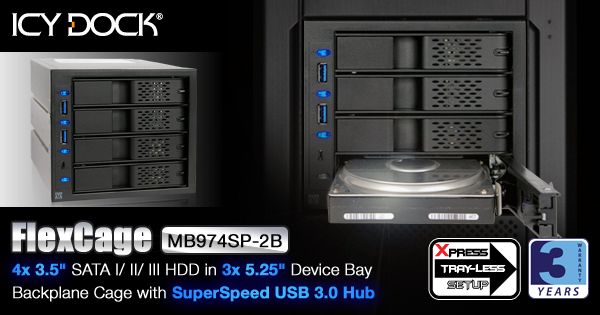 The MB974SP-2B is designed to maximize space use by allowing up to 4 x 3.5” SATA 6Gbps hard drives, while only consuming three 5.25” device bays. 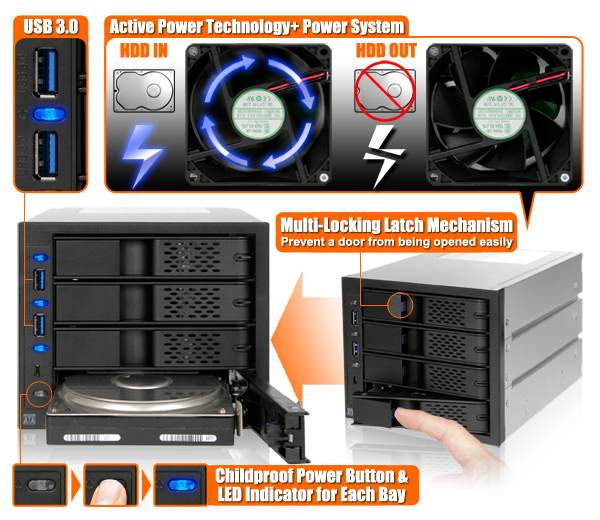 The FlexCage also only requires two 15-pin power ports to power up to four 3.5” hard drives. The FlexCage is equipped with our renowned tray-less technology – no screws or tools are necessary to insert or eject the drives, making hot swapping a completely hassle free experience. The MB974SP-2B gives the user freedom to choose the speed of the fan, or to select “auto” so that the fan adjusts its speed using our Smart Cooling Technology. Our auto function determines the temperature of your drives, and changes its RPM accordingly. This results in decreased power consumption, an increased lifespan for your fan, and unnecessary excess noise. Along with the auto function, the user can also choose a high setting, best used for intense applications such as home server use, or a low setting, best used with lighter work loads, such as hourly back ups or audio recording / editing. 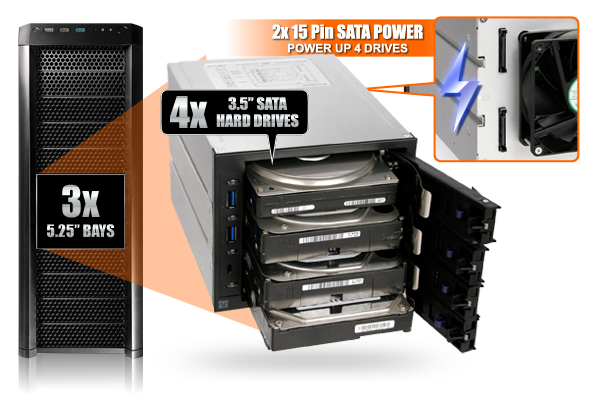 * Fits 4 x 3.5” SATA III HDD into 3 x 5.25” Device Bays. * Active Power Technology+ – cooling fan and drive only powers up when the child proof buttons are pressed.